The former main entrance of the building now leads to the holiday rental apartment Meschio. You will recognize the typically Venetian architecture. If you are looking for a self-catering holiday rental in Venetia in northern Italy , please take a look at the apartments recently restored in the outbuildings of the Villa Brandolini Rota, at only one hour from Venice. The self-catering apartment Meschio takes its name from the river which runs below its windows, separating the property from the village of Cordignano. On the other side of the river lies the village’s main square where you will find a café and a few food shops. 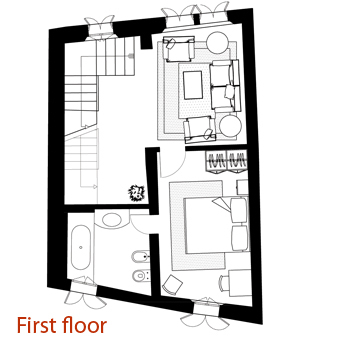 The apartment develops over 3 floors (ground floor plus 2 upper floors). You enter the property through a large wooden door which opens onto a porch leading to the garden and , through a side door, to the hall. On the ground floor you will find a kitchen and dining room. On the first floor the large living room looks out onto the river and the main square in the background through a typically Venetian double-arched window. 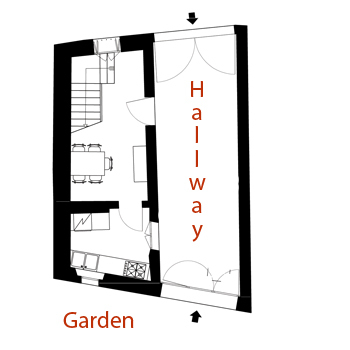 Next to the living room lies a double bedroom with adjoining bathroom. 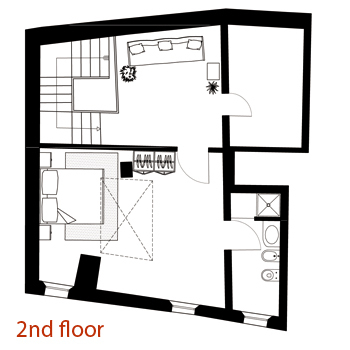 On the second floor lies a suite with double bedroom, bathroom and living room with sofa bed for two extra guests if needed. Wir sind nun wieder aus Cordignano zurück und haben herrliche Tage dort verbracht. Es ist ein tolles Anwesen, mehr als empfehlenswert. Sehr nett und hilfsbereit war auch Silvia die sich sehr um uns gekümmert hat. Vielen Dank nochmal und ich hoffe bald wieder über Sie eine Ferienwohnung buchen zu können. Kaffee, Öl, Salz oder Pfeffer....) und wir es wünschten, fanden wir es. Silvia war stets hilfsbereit und bereitete uns einen sehr freundlichen Empfang. Ziemlich sicher werden wir auch in Zukunft über Sie buchen, da Ihr Service wirklich hervorragend war, wenn wir eine Reise nach Italien planen.